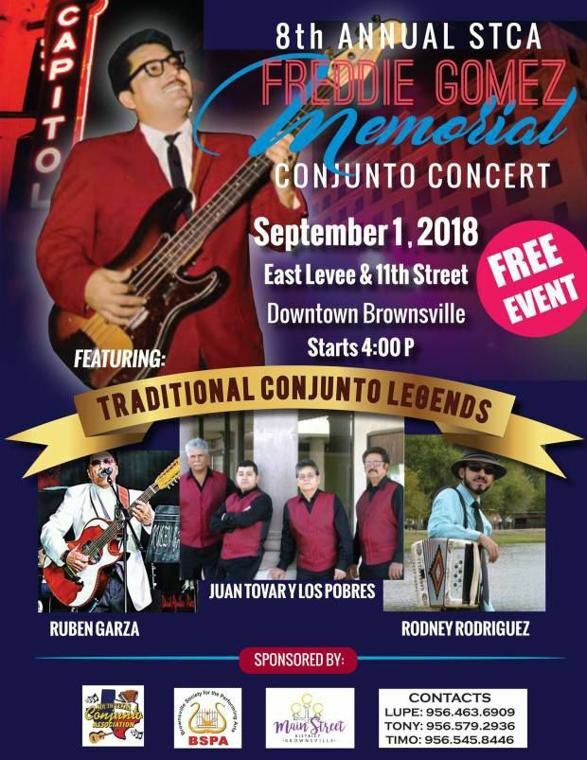 The South Texas Conjunto Association will hold its 8th annual Freddie Gomez Memorial Conjunto Concert at 4 p.m. Saturday in downtown Brownsville. The South Texas Conjunto Association will hold its 8th annual Freddie Gomez Memorial Conjunto Concert at 4 p.m. Saturday in downtown Brownsville. The free event will be held at 11th Street and Levee Street. The festivities will start with an hour-long tribute music mix by DJ Tony Hernandez that pays homage to conjunto artists who have passed away during the preceding year. The welcome ceremony, national anthem, lifetime honors, youth accordion performances and a 20-minute dance marathon with cash prizes will begin at 5 p.m. Performances by Ruben Garza, Juan Tovar y Los Pobres and Rodney Rodriguez are scheduled to being at 7:30 p.m.
Timo Ruedes, co-director of the Brownsville STCA Chapter, said the dance contest will involve seven music rhythms that start with a waltz and end with a huapango. The audience, which usually numbers about 800 through the evening, will select winners by cheering, he said. The event will also include food and shaded seating, though South Texas Conjunto Association President Lupe Saenz said attendees are welcome to bring their own lawn chairs. The organization selected Garza, a Harlingen native, as the recipient of its Conjunto Ambassador Award in recognition of his nearly 55-year music career that includes 71 albums and numerous awards. He is known for the groups Ruben Vela y Su Conjunto and Los Dos Gilbertos. Juan Antonio Tapia, who directs the Brownsville STCA Chapter alongside Ruedes, said the concert began as a Sombrero Festival event and grew from there. Tapia said the City of Brownsville has put its support behind the event. The Brownsville Society of the Performing Arts is also a co-sponsor. He said attendees come from around Texas and out of state to hear the bands play. “We’re very proud of it because it’s people that recognize and grew up with this type of music,” Tapia said. For more information, visit www.conjunto.org.